Still can't get enough of Pokemon Go? Follow the news for free on freenet, and learn how to make in-app purchases via PayMaya! Pokemon Go just launched in Japan, the birthplace of monsters big and small. Southeast Asian countries would need to wait a bit more before they can join other Trainers in the quest to be the very best, but apps and services like freenet and PayMaya have thrown in their hats to the Pokemon Go craze. Those who want to stay updated on news about the upcoming release of the game in the Philippines may now download the freenet app on the Google Play Store and the Apple App Store. Through freenet, Smart, TNT, and Sun subscribers will be able to read the latest news and social media feeds from the local Pokemon GO community for free and with no data charges. This is part of freenet’s mission to enable communities such as those who are eager to play Pokemon GO to stay active and participate in various activities and discussions through digital means. Meanwhile, once the Pokemon GO app launches in the Philippines, players will be able to fully enjoy the game through inapp purchases with the help of PayMaya, the easiest way to pay online even without a credit card. 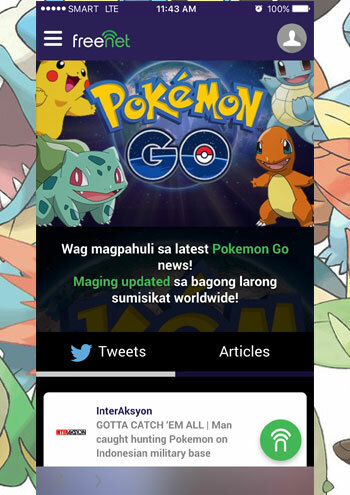 Players only have to download the PayMaya app on the Google Play Store or the Apple App Store, load up their accounts with at least P60 to cover the standard app store verification fee, and link their virtual VISA card to their app store accounts to be able to make inapp purchases for Pokecoins, the in-app currency used inside the Pokemon GO game. With the help of Pokecoins, players will be able to purchase various items that will help them easily navigate the game, such as Pokeballs to catch Pokemon with, Pokemon eggs that allow them to “hatch” Pokemon, Potions to restore the health of their Pokemon, and Incense and Lure Modules that make it easy to attract wild Pokemon to their immediate vicinity. PayMaya has over 15,000 loading stations nationwide mostly found in SM and Robinsons malls, 7-Eleven outlets, and Bayad Centers. We’ll be publishing a guide on how to use your PayMaya card to purchase Pokecoins once Pokemon Go becomes available in the Philippines, so stay tuned!